Here’s to a Hassle-Free Holiday Season. Happy Friday to all. Hopefully where ever you might be, the weather there isn’t half a gross as it is here. I have to say y’all, I am just so over this humidity. It is near about the end of November and it is hot as blue blazes outside. What’s a girl gotta do for a weather change around here? Enough of my fussing. For most people, the end of Thanksgiving brings the start of holiday decorating. But not for me. At An Orderly Abode, Christmas can be a very busy time of year. Being that I am a Seasonal Decorator, I start holiday decorating early (so I have time to fit everyone in). This year’s first client was 2 weeks before Thanksgiving! That might seem a bit premature, but it was not a residential home. It was a hair salon. So, that makes it okay. Right? What am I saying? I don’t have to justify this! Some crazies leave their holiday decorations up ALL year long! Besides, it’s the happiest time of year. That is reason enough to enjoy it even sooner. 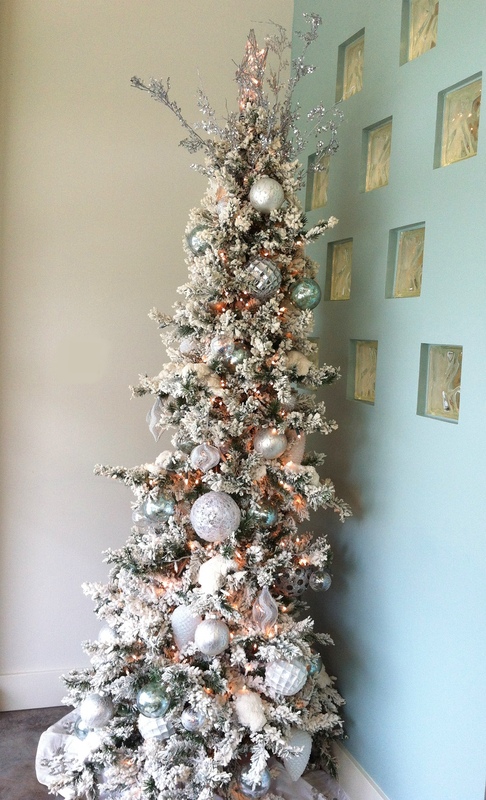 D’Novo tree adorned in silvers, whites, and sparkling seafoams. Many of you might consider this annual ritual of decorating to be a dreadful one. Be not afraid. With a few of these simple tips and tricks, this year’s holiday season will not be spent in disorder and chaos, but rather in great delight! Here are some of my most favorite and effortless ideas to keep you in order this year. The Dreaded Christmas Card. It seems like such a daunting task, and things are crazy/busy enough during the holiday season. How about an automated contact list. Yes, it seems so technological and impersonal. But it really isn’t. Besides, we might as well get on the technology bandwagon soon enough. Everyone else is. The process is quite simple. All you have to do is enter your friend’s and family’s contact info into a mailing label format in Word. Print, peel, and stick! Undemanding mailing as it’s finest! And for those of you who feel like taking it to ANOTHER LEVEL … Transfer that contact list into a spreadsheet, using separate columns for each category: name, address, birthday, age, gifts purchased, and gift ideas. Trust me, knowing who needs what, and who is finished, can greatly reduce your time shopping. 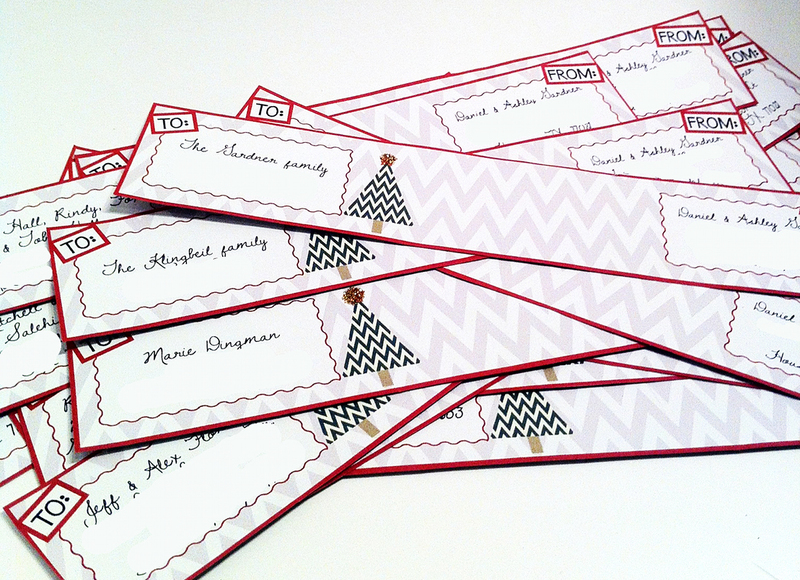 “Printable Wisdom” printable address labels. With the holiday season comes HOLIDAY PARTIES. A lots of them! Take the stress out of these socials with a bit of pre-planning. Whether you have an entire room, closet, or dresser drawer, designate one space for gift wrapping and gifts. Everything needs a home, and if everything is in it’s home, it will make getting out of the door a much quicker task. Throughout the year I like to accumulate an assortment of hostess gifts (candles, accessories, wine, bath salts, etc.). Keeping all of these little happies in a home close to my gift wrapping things, makes taking a gift so effortless. 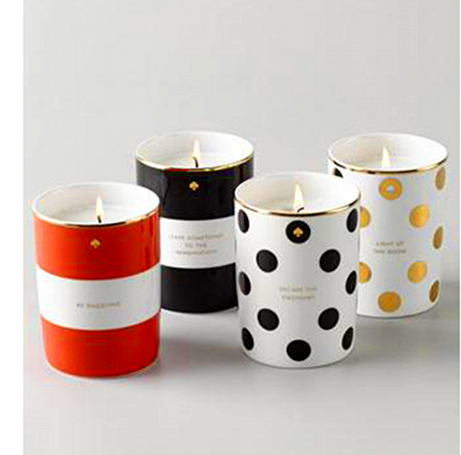 Kate Spade candles make a lovely hostess happy. Wine tote from 14Elm on Etsy. 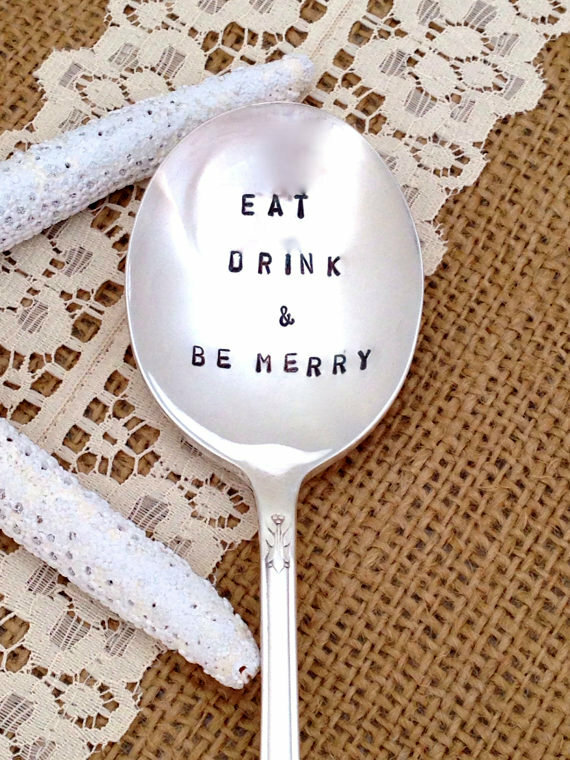 Etsy Vintage hand-stamped serving spoon from BlueCrabb. The hassle of hanging lights comes down to one important factor. The tangles. Let’s face it. Typically, we are the ones who sit around de-tangling strand after strand of white lights, while the “muscle man” does the hanging. If we eliminate the tangles all together, we could save ourselves the grief. So here is what I do. I go with the individual approach. One strand at a time, test each set before storing away. If there are any dead bulbs, replace them now. Toss the strands that do not work. Make a loop with each strand and wrap the ends around the loop (as shown). Store each individual strand in its own sealed one-gallon Ziploc bag. This will prevent one from getting tangled with another. 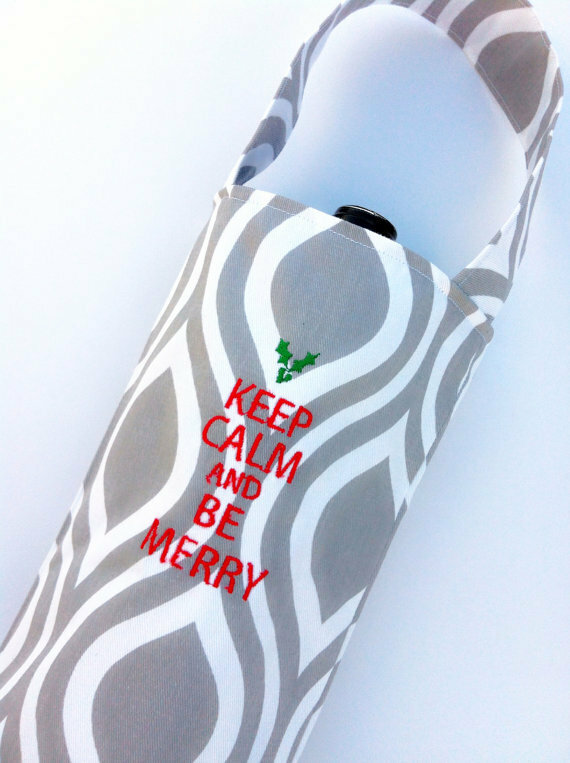 Leave some air in the bag to act as a cushion that will protect the bulbs. 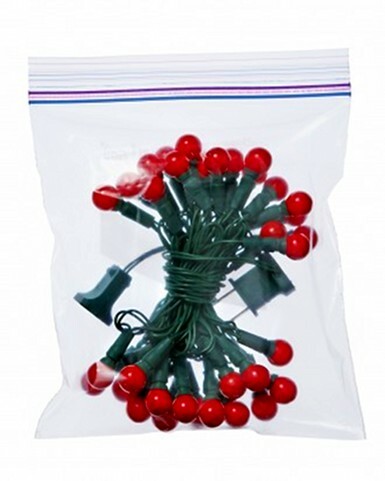 Keep all extra bulbs and fuses together in their own Ziploc bag. Stack the sealed bags in a large storage container. If possible it is best to avoid storing Christmas decorations in the attic or basement (because of the temperature changes and moisture). Keep lights in working order. 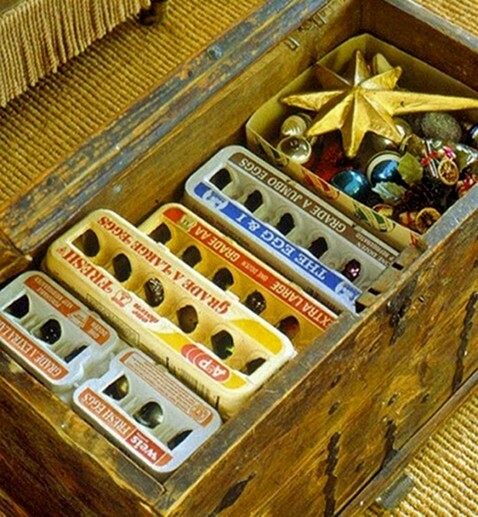 When it comes to decorating and “un-decorating” when the season is over, organization is key. With a good system, it can be done in a jiffy. Important* … Containers are crucial! Designate large containers for each category (lights, garland, fragile ornaments, tough ornaments, kitchen, etc.). Don’t forget to label these containers. 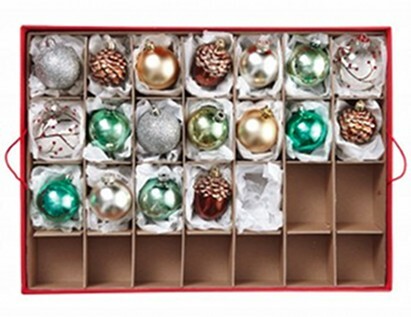 There are many methods out there for keeping ornaments safe and organized. For fragile ornaments, I prefer to wrap each ornaments individually in tissue paper before placing in plastic bin. 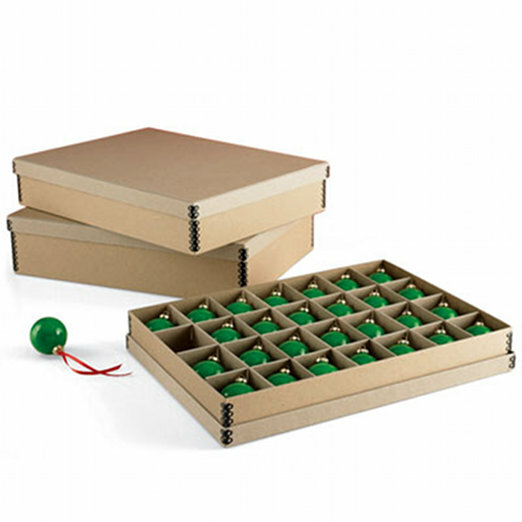 For other, not so fragile ornaments, a segmented cardboard box works wonders. The Container Store sells an excellent option for ornament storage (that I have had my eye on for a while). 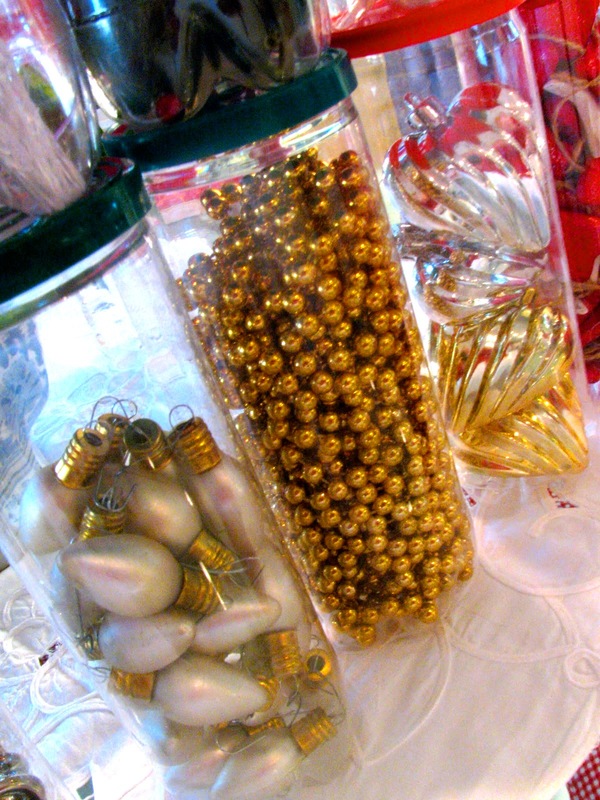 Here are some ideas to inspire you while packing up your ornaments this year. Recycling is a great “on the house” option to keep in mind. Tennis ball cans from “May Days”. My best solution for the time consuming storage issue that comes along with the holiday season, is GO GREEN. Taking the time to unpack and pack up all of the wreaths and garlands can really be a bummer. While it may not be as economical, fresh greenery is a big time saver. Not to mention its other perks… That yummy sprucy smell we all love so much, and the timeless style that comes with simple, live greenery. Going Green might just be my favorite part of the holidays! 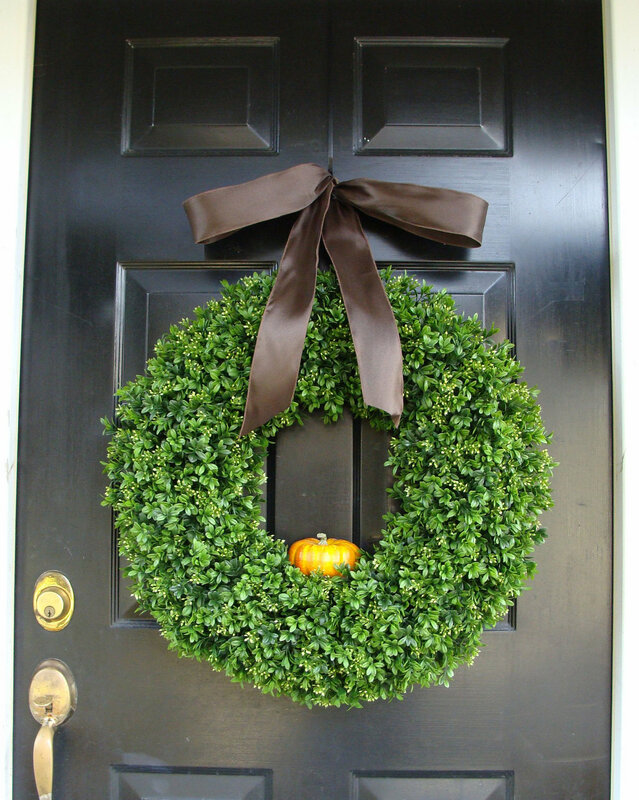 An elegant Boxwood wreath. Simple and timeless. Hey there! With Halloween over and Christmas right around the corner, it seems as though my busy plans for holiday decorating have led me to neglect the celebration of the fall harvest. Thanksgiving! I feel like this happens every year. I start Christmas decorating for my clients the weekend before Thanksgiving. Between shopping and planning for everyone else’s holiday trimmings and my own, poor little Thanksgiving sadly goes overlooked. But not this year. This year I am making a change. 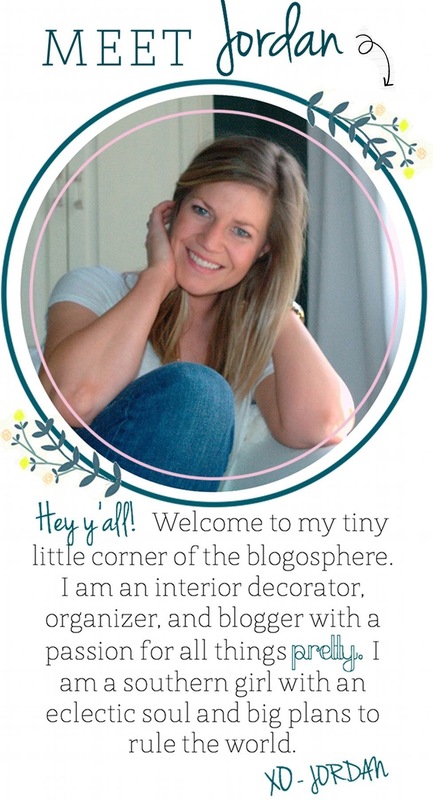 I have taken inspiration from all over; around town, Martha (of course) and my favorite online sources. 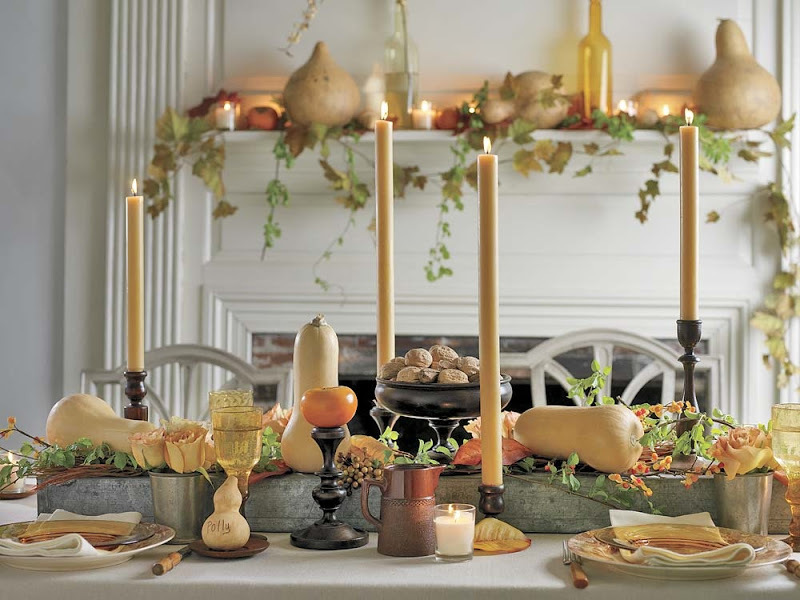 Let me share some photos to help inspire you when planning for your Thanksgiving Day Feast. 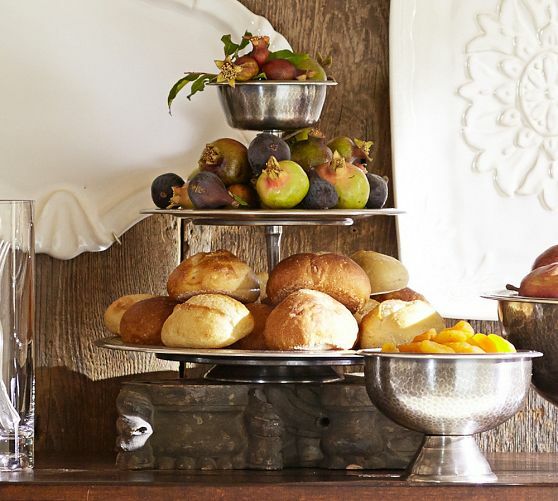 Whether it be an elaborate table-scape or a simple entryway touch, celebrate the harvest IN STYLE! There is no rule that says every table scape requires an array of fresh flowers. This setting has taken cue’s from the seasons bounty instead and it couldn’t look more chic! 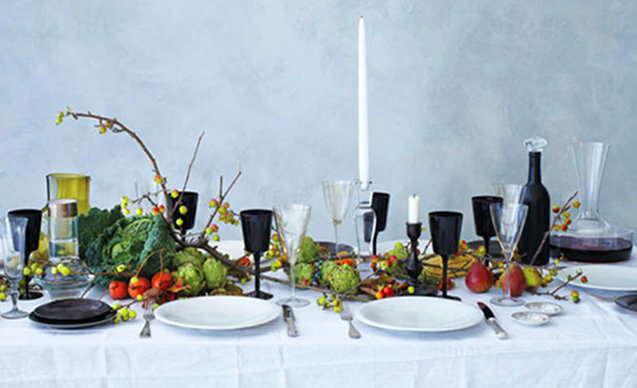 Break bread in the company of plenty of gourds, walnuts, candles and fresh roses in the pretty muted hues of orange. 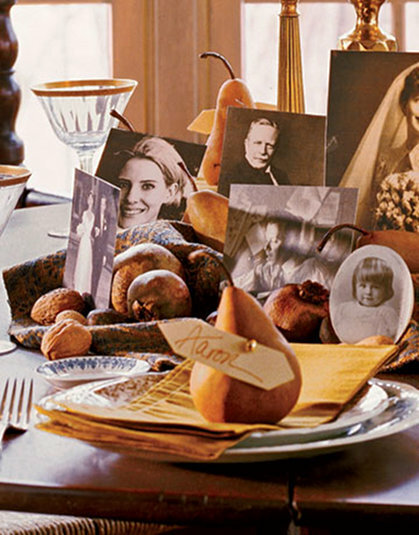 Print old family photos in sepia and nestle in a tray of nuts for a comfortable, rustic approach to the typical Thanksgiving table scape. 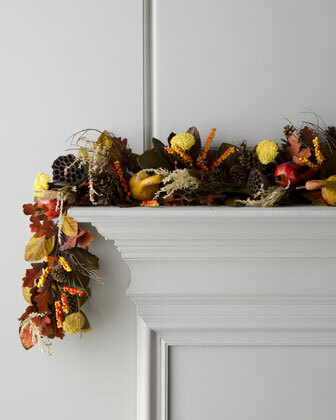 This beautiful 6′ harvest garland is now on sale at Restoration Hardware for unbelievable $68!! Pottery Barn offers us the staples. While all of your friends might have the same one, 5 or 10 years down the line, you will be glad you had one for every soiree. 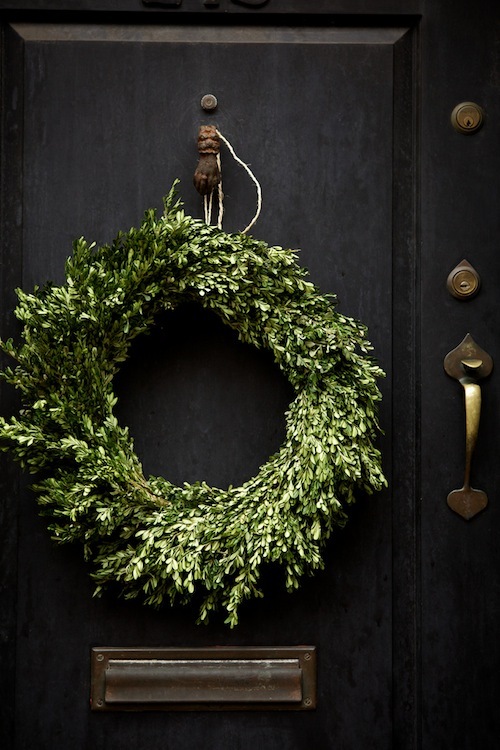 Sometimes an uncomplicated approach to seasonal decorating makes the most impact. I hope y’all enjoyed a little harvest inspiration. Stayed tuned to see photos of MY Thanksgiving supper and all the pretty trimmings that go along with it. I have been boo-coo busy this week working on a project for a brand new client! Yay! You know what that means. It means, if things go great and they love the space, we move on to the rest of the home. I must say, this project has got me more excited than I can utter. I was hired by a sweet, single father looking to give his daughter a brand new, big girl bedroom. That lucky, 11-year-old girl goes by Allie and is quite possibly the most kind, and bashful 11-year-old out there. To get things started, I went over for the typical in-home consultation to get a better understanding of Allie’s hopes and ideas for her new room. By the end of our meeting, I had a pretty good idea for the direction of this space. She expressed to me her love for all things girly and delicate as well as her taste for trendy and bold finishings. 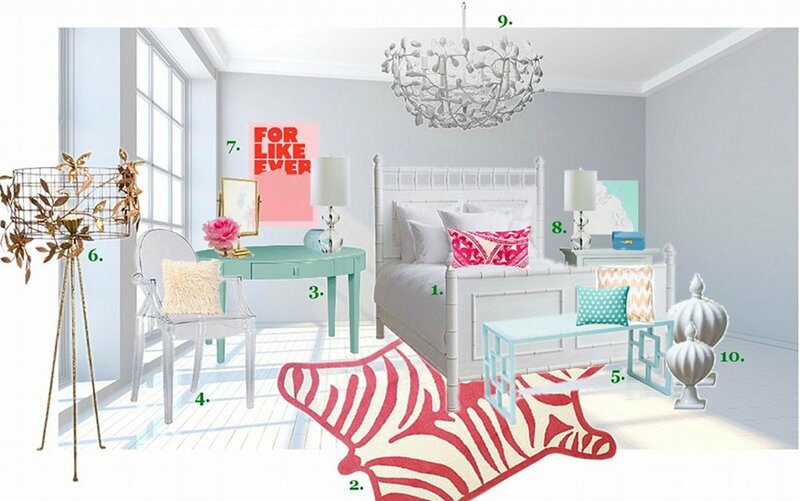 When it comes to decorating a room for a pre-teen, the options really are endless. My rule of thumb, however is to steer clear of “trendy.” Trendy gets old, fast. And when Daddy is spending a pretty pretty to give his girl a new room, I’m sure he does not want to have to do it all over again in a year when she out grows her neon-green room. Just saying. So I choose to stick with pieces she can grow with. Moving on. Allie picked out a duvet set from Pottery Barn that she had her heart set on. While I was not exactly oozing over this particular duvet’s pattern, it’s not my room. It is Allie’s room and I am here to make her happy! The pattern had a tropical feel to it, so my plan was to find a way to tone the pattern down a bit. I did this by layering it on top of a white coverlet and sheets, serene drapery panels , and a muted wall color. About that wall color. When going through the paint deck, Allie instantly was drawn to a very saturated teal color mimicked in the bedding pattern. This color gave me a bit of a fright. Not that anyone should ever be afraid of bold color, I just prefer to keep those colors in the accents. I managed to talk her into moving a few colors up on the paint deck to a more muted aqua I would call Robin’s Egg Blue. Here is a photo of my initial mood board for the space. For those of you who are not familiar with Olioboard, you are in for a treat! Olioboard is on online tool that allows users to create and mood board using furnishing and textiles, etc. sourced from some of the most popular home decor retailers out there; and I just love it. Being a decorator, it is easy for me to visualize things in a space without actually having to see it. But for others, such as my clients, a print out of one of my olioboards is an excellent way for them to visualize my plan and mood for the space before we swipe the credit cards. This particular olioboard was created before the in-home consultation, just having a very general idea of what Allie, and dad, had in mind. Stay tuned to see the before and after photos of the finished room!